Buying table tennis rackets – The straight and honest racket advice! 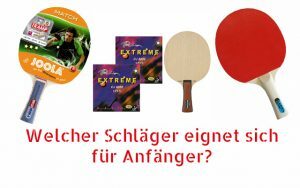 Everybody who wants to buy a table tennis paddle / racket will find a great selection at www.tt-shop.com. 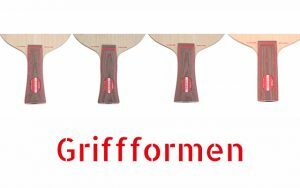 From a well structured range with respect to paddles for leisure and recreational activity, all the way up to elite and professional table tennis rackets for more than 200 Euro/bat. You can find anything your table tennis heart desires. But: Do you really need a table tennis bat for 200 Euro in a club? Is 10 Euro too cheap even when just using it at the pool? What is the best table tennis racket? Which table tennis bat is appropriate for my individual way of playing? Which brand produces the most popular table tennis paddles? How much is a professional table tennis bat? The following sections aim in providing an overview regarding all TT rackets available in this shop. Of course, you will find the answer to all of the above mentioned questions within this text. Who is interested in more information regarding table tennis, is welcome to contact us at any time! Table of contents – What do you want to know about table tennis bats? Which is the best table tennis racket? Buying table tennis paddles, or compiling them by yourself? Before a recreational or a club-player wants to buy a table tennis bat, many questions have to be resolved first. The problem is that when searching for a bat, one is spoiled for choice with respect to manufacturers or gaming orientations. It is, however, your final choice whether to buy an all-round, offensive or defensive table tennis racket. Please note that it is very important to get familiar with this topic. Otherwise, you will buy and pay twice. The first question is, how much of professionalism must the racket exhibit? And: What is your budget? Generally, in this online shop you can buy any type of table tennis paddle which is available on the market. If you cannot find your desired bat immediately, please contact us and we will do our best to find and assemble your choice for you. We offer a large selection of table tennis rackets! Starting with inexpensive big-store bats for approx. 7.50 Euro, all the way up to elite table tennis rackets for more than 200 Euro: You will find a very wide range of bats. We tried to maintain our offers as clear and structured as possible, but just look through the categories by your own. Of course, experienced and skilled club players may assemble their bat by their own. For this, a detailed description can be found in bullet point 4. Possibilities are almost unlimited. In most cases, however, players simply don´t have the time to conduct much research. Due to this report, we tried to keep this research at a minimum whilst being most informative. For inquisitive table tennis players, we tried to collect as many information as possible, and in a structured manner. Have fun reading through at www.tt-shop.com! Maybe you have also asked yourself this question: What is the difference between a run-of-the-mill ping pong paddle and a professional racket? Are run-of-the-mill paddles always identifiable by means of a low price? And are they, in those instances, always worse? For what kind of players would a run-of-the-mill TT paddle possibly be sufficient? To enlighten those questions, we want to answer those (and other questions) in the following sections. Reading through is worth it! Let´s first start with some similarities between a run-of-the-mill table tennis paddle and a (professional) table tennis racket/bat. Both belong into the category table tennis bats. Such a bat, paddle, or racket basically consists of three main components: The handle, the blade (in most cases made of wood) and the rubbers, which are made of plastic material (rubber (caoutchouc) compounds). Handles are available in four different forms: straight, concave or also called flared (mostly used), anatomic(al), and conical. The blade of the table tennis bat consists of various thin layers of wood, which are glued with each other. However, also layers of (partial) plastic / synthetic materials are used. The properties of the blade strongly correlate with the properties of the material used. In this context, there are harder woods (e.g. walnut, wenge), softer and lighter woods (e.g. obeche, balsa), or combinations of both. Both, rackets and run-of-the-mill paddles, also have rubbers, which are glued onto the blades. Rubbers hence are a kind of connecting element (together with the so called sponge) between the blade and the ball. Therefore, they make a substantial impact on jump and flight behavior of the balls. All rubbers also have pimples, either directed in(wards) or out(wards). In 1986 it was decided that one side of the bat has to be red, the other black. 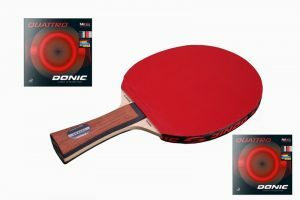 Run-of-the-mill paddle versus professional table tennis racket - What is the right choice for me? Especially for a beginner and newbie it might be the hardest choice to make: What TT bat to buy? Nowadays, there is an enormous offer regarding bats, that it seems too demanding. One is simply spoilt for choice. To make this decision easier, one first has to consider who is searching for a paddle. Are you a recreational player who is playing at school or during the break, or maybe at home in the basement? Or just from time to time to de-stress and relax? In this instance, you will probably have more fun using a normal "run-of-the-mill" bat instead of a professional bat, and not only because the former is cheaper. Even if you are planning on playing with ambitions (maybe several times a week), or planning on joining a table tennis club: Even then, a professional bat is not (yet) the best choice. The reason for this can be found in your table tennis skills, and in the different properties, which make the difference between a run-of-the-mill racket and a (professional) racket. Why it is like this, and what it means for you: Just keep reading! A simple table tennis bat (in the vernacular also referred to as run-of-the-mill bat/paddle/racket) is often available finally assembled, and is usually quite inexpensive. Often, such bats are available in big stores or online. 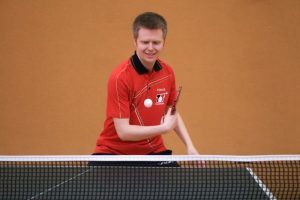 If you play table tennis occasionally, during your leisure, as an occasional hobby, just to relax, and if you are confident with it without further ambitions: Then an easy and simple "run-of-the-mill" bat is really ok for you, and probably the best choice. Those bats are available for as little as 10 Euro. Note that the quality of simple run-of-the-mill bats is quite low. This is related to all components of the bat. For an occasional use, as described above, however, this is really ok. The next category also describes beginners. However, they are ambitious to play table tennis more often and regularly, they want to improve themselves, become better whilst having fun, and maybe even join a club in the future. For those beginners it is important to learn various basics, such as topspin, serve, backspin, and so forth. But also to develop an understanding of table tennis, the training of coordinative skills, learning and stabilizing various techniques etc. All these considerations are fundamental issues for beginners with ambitions. Such learning phases often take –depending on talent and frequency of training– one to two years. Over the time, a highly individual way of playing will emerge: Some are more offensive (Off), some more defensive (Def) or a mixture of both (all-round, All). This means: First (as a beginner during the learning phase), the material of the bat has to exhibit certain properties in order to fulfill these criteria. After some time you will exceed the level of a beginner. Let´s say you play an Off style, then it is recommended to use faster rubbers. Examples are the Andro Hexer Duo, the Xiom Vega Europe; or classical hard rubbers, such as the Yasaka Mark V or the Donic Coppa. Try to use thicker sponge layers in those instances. As you can see, high-order and superior TT rackets can be assembled very individually, and this can also be adapted from time to time. And yet here we are at the final category: Advanced players and pros. In such cases, it is well known what kind of style you prefer. In other words: Off or Def, or maybe another preference of playing. And this can exactly be transferred "into" the bat: faster or slower rubbers and blades, spin behavior, and so on. 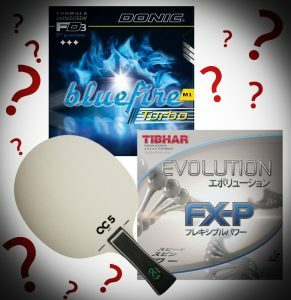 Bats for advanced players or for pros are useless for beginners, because they do not account for the unskilled level of a beginner, and damage the optimal table tennis specific development of beginners more than providing support. Professional rackets consist of individually customized layers of woods, special sponges and rubbers. Over the time, those can be replaced or changed by yourself in order to optimally adapt the racket as a whole. Likewise, also professional rackets are available in different price and quality sections. Please note that inexpensive, finally assembled paddles are, for example, very restrictive regarding their ability to (easily) replace the rubbers. For pros with an offensive way of playing, powerful, hard, and fast materials are the optimal choice – in most cases. For example, the Butterfly Tenergy 05, the Tibhar Genius, the Andro Rasant or the Donic Bluefire M1. I hope you could get some basics which make your choice a bit easier. The topic "run-of-the-mill" bat vs. a "real" bat will probably stick with you for a very long time. The category Hobby and Recreation contains articles suitable for players who want to buy a bat for recreational activities. We believe that such table tennis bats are very suitable for hobby and recreational activities. They are available in different price categories and may be adapted individually regarding various needs of recreational players. See for yourself! At this point, we would like to provide a first hint: There is no finally assembled racket equally of high quality compared to individually assembled and compiled rackets (that is, blade and rubbers mounted individually). 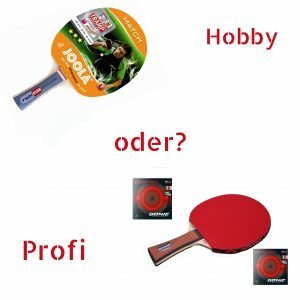 Most of the rackets being listed in the category hobby and recreational table tennis bats are recommended for hobby activities, and not for club activities. Everybody thinking about buying a professional table tennis racket is commonly at the beginning of her/his table tennis career. Especially for the transition from the higher hobby level to the first club activity, we compiled bats most suitable for this stage. In terms of equipment, table tennis is a kind of sport where lots of advice is required. This is because every player has her/his individual way of playing. At the same time, however, the number of available table tennis paddles has grown immensely so that there is probably no club player who still has an overview over all new and all established products. Those paddles being listed in the category starting in a club, are our specific recommendations. By the way, the most popular product is our professional table tennis bat: 100% positive feedback and cero customer complaints. Of course, you always decide. The following link guides you to our bestseller and to our concrete recommendation regarding Starting in a Club. There is no other sport where the choice of the right material plays such an important role as it is the case in table tennis. Every player always searches even more suitable rubbers, blades or bats. Even hobby players blame the better equipment of their opponent for a lost match. This highlights the jealousy with respect to the opponent´s five star table tennis bat, while only having a three star bat. The best table tennis bat should be the solution. With this, no game will be lost anymore. Unfortunately, there is no best table tennis racket. This is because every player has her/his own individual capabilities, which are suitable for very specific bat compositions. Regarding the search for the best table tennis paddle, it should be paramount to check the basic and individual properties of the way of playing. The speed of the TT paddle plays an important role when choosing a paddle because it truly determines they way of playing. Of course a very defensive player may indeed choose a fast and speedy bat. However, the question remains whether or not this allows for all of her/his potential when playing. Optimal means that the speed is fully exhausted. This, again, mainly depends on the own technique, and on the gaming level. A speedy and fast table tennis bat doesn´t forgive technical errors while playing. In contrast, a much slower bat does, as often used by beginners. This brings us directly to the next point when considering optimal gaming properties: Ball control. Sure, this predominantly depends on the expertise and capabilities of the player. Further, ball control is also related to speed, however, not always. Other factors, such as rubbers, composition of the blade/s (100% wood or maybe fiber-reinforced), total mass or the individual daily condition, also influence ball control. An important hint with respect to bats for beginners is also provided in an earlier article dealing with what differences there are regarding bats for beginners. The best table tennis racket is commonly strongly associated with high spin. In table tennis, rotation (also referred to as spin) plays a fundamental role. Based on this, the quality of strikes is grounded. This was recognized in both, amateur and professional sports. Hence, the search for even more spin and rotation is still very important. Playing with lots of spin is important. However, it is more important to reduce the opponent´s spin. Those of you who cannot deal with the spin coming from the opponent, will lose. Therefore, the best table tennis racket is also one that reduces the opponent´s spin. The quality of sports equipments is also important in table tennis. What is the use of the best table tennis paddle, if it is worn off after a few weeks already? Quality may be identified by considering the blade/wood. A high-quality blade, e.g. the Waldner Offensive 2016, consists of high-quality veneer layers, and a perfect workmanship. Also, the rubbers (especially the outer layer) is highly robust and catchy even after hours of usage. However, the caring and maintenance of rubbers plays an important role with respect to their durability. Maybe this seems as a rather unimportant issue: The shape of the handle. However, the right handle is indeed advantageous. The most popular and most used handle is the flared handle. For junior players between 6 and 11 years, a common recommendation is to use table tennis bats for kids. Those bats offer a special handle, which is adjusted to the anatomical properties of a child´s hand. More information regarding shapes of handles can be read in our article "Handles of table tennis bats". To conclude, we can say that there is no best table tennis racket or paddle. Instead, it would be more correct to use the phrase optimal table tennis racket for my individual style. And the ingredients for this can be found in our shop! Just have a look at our hints for bats and offers. Of course, you can individually assemble and compile your own paddle based on our huge range of products, such as rubbers and blades. The initial question, whether to buy a "ready-to use", finally assembled table tennis bat, or whether to search for individually suitable rubbers and blades on your own, can best be answered by you. In general, we offer, as already mentioned, many many possibilities to buy a table tennis bat. Everybody may compile a blade and two rubbers for her/his individual needs. By now, our range of products includes far more than 1.000 different blades and rubbers for table tennis. You can find an instruction as to how TT Shop assembles a table tennis racket for you under the link table tennis bat configurator. 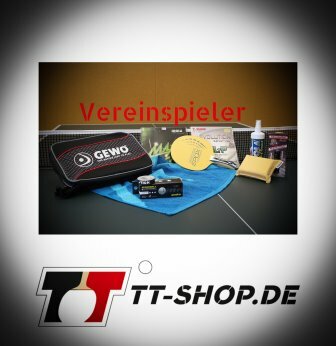 There is an intense and fruitful partnership between our table tennis shop and, probably, the best-known table tennis blogger in Germany, Marcel Arnold, available via his homepage www.tt-spin.de. 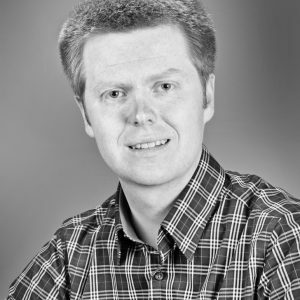 His table tennis blog aims to publish test reports with focus on rubbers, however, brand-independently. Of course he also writes about table tennis bats. In his huge and high-quality Test of Table Tennis Bats from 2016,he shows his own personal review on the best professional table tennis rackets. This review is indeed a real read worth it, if you are planning to buy a racket. Here, we provide an overview of the test results. At the beginning of this report we already mentioned that our web page www.tt-shop.COM contains the a big choice of bats in the whole web. You might have thought: "Well, anyone can do that!". It can´t be that hard, isn´t it?! Suppliers provide pics and texts/descriptions of the products, one employee might have to sit down doing a little office work for a couple of days: Creating a shop-backend of the products, copy-paste product descriptions provided by the manufacturers and there we go, that´s it. Indeed, that´s what we could have done as well. But, we didn´t! In our shop, every description of any product, no matter if blades, rubbers or finally assembled bats, is self-panned. We are convinced that the whole table tennis sector is way too complex to confront every customer with it. Statistically speaking, every brand launches 3-5 new rubbers and 3-5 new blades onto the market each season. 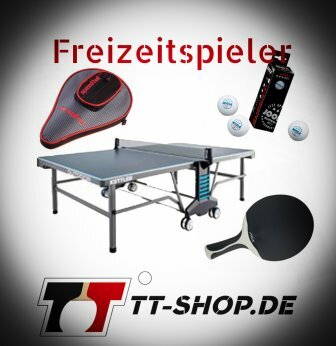 In contrast to the fashion industry, where, for example, seasonal products disappear from the selection at the end of summer, table tennis products (such as popular blades and rubbers already available during the 1980ies) are available throughout the course of time, until today. This results in a kind of carousel of products and equipments, never stopping to rotate. 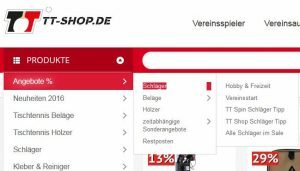 How does www.tt-shop.com deal with it? How do we counteract this confusion? First, by our concrete recommendations regarding paddles, e.g. 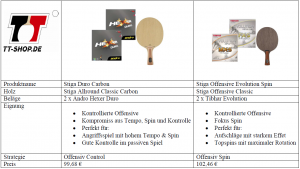 via our elaborated test of table tennis bats from 2016, in cooperation with ww.tt-spin.de. Second, we also provide guidance regarding the complex thicket of bats for hobby and recreational players. 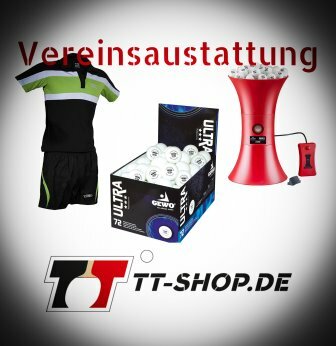 As a very first online shop, we integrated the catalogue of products from the manufacturers for club players. This means that, regarding certain product criteria, such as speed, control and spin, you can search for yourself in the overview pages which we sorted due to brands. Summary table of all Stiga blades: Which Stiga blade exhibits the most control? All Donic rubbers at a glance: Which Donic rubber exhibits the most amount of spin? The rubber family "Tibhar Aurus": Including low cost (savings) set of 2 rubbers & bats on special offer. No matter what blade or rubber you choose: We assemble and compile your bat for you. For free. This is me, the author: Matthias Bormann, while playing a backhand topspin at the table. Another highlight regarding the advice of table tennis bats is the selection of bats sorted by product families. The world of rubbers is gigantically huge. For this reason we were thinking about how to bring some order to it. Next to the choice of table tennis brands, we decided to also separate rubbers within the various brands. This makes sense since many manufacturers brought table tennis rubbers to market which may be associated with an individual product family. Often, the outer rubber of some rubbers is identical, and the fine tuning as a whole (exact differences between the rubbers) becomes evident by a different hardness of subjacent sponges. Back to the bats: For each overview page with respect to rubber families, there are at least 3, often more, low-price paddles listed. Many players choose rubbers in such a way that they fit to the blade, and not the other way around. This means that the starting point regarding the right choice of a ping pong bat is the blade when searching for products. Club players use their table tennis blade for approx. 4 years before the blade is "running down", or before there is the wish for another blade. If you are planning on buying a new table tennis bat, we exactly recommend this way (in case you didn´t choose another product of our shop, such as discounted ready-to-use bats, already). This way of carefully analyzing various blades is –in the long run– the best way. This is because one should first really think about what blade/wood to choose, and then to decide which rubbers may be suitable or not. This approach makes more sense compared to first choosing rubbers and then to decide what blade suits the previously chosen rubbers. Most club players use a table tennis bat (as a whole) for approx. 1 year. After 1 year, rubbers are worn-out and should be replaced in order to allow for the best possible success when playing. In contrast, the blade lasts far longer, provided that it is properly maintained and sealed. Therefore, changing the blade is only recommended when it is broken somehow, or when there is a change in the style of playing. Similarly to our web pages of recommendations regarding rubbers, overview pages regarding blades are planned containing concrete recommendations for bats. Our shop will develop and prosper continuously! Are there any questions with respect to the choice of the right bat? Please, contact us at any time!